★ MOVING ALERT - The finder is designed as the 3rd generation in 2018. It will make sound alert together with the phone when someone try to move your keys, handbag and luggage. ★ ANTI-LOST ALARM & 3 TIMES LOUDER - When the phone and this key finder goes out of range, both phone and device will make sound alert. The effective range is 32-50ft indoor and 160ft outdoor. Up to 98 decibel melody that nearly equal to phone ring. ★ LOCATION TRACKING - In case of lost or disconnected tracker, APP records its currently or last disconnection location in the map. If you last your item, our network may help to find. ★ SELFIE & ULTRA LONG LIFE TIME - The button on the device also doubles as a camera remote. 3V Sony lithium battery result in nearly 12 month life time, longer than the average 3-6 month. ★ BIDIRECTIONAL FIND - When it is connected to your phone, hold the finder button and your phone will make sound alert. Open the App and tap the "ring" on the App, the finder will beep and LED will flash. 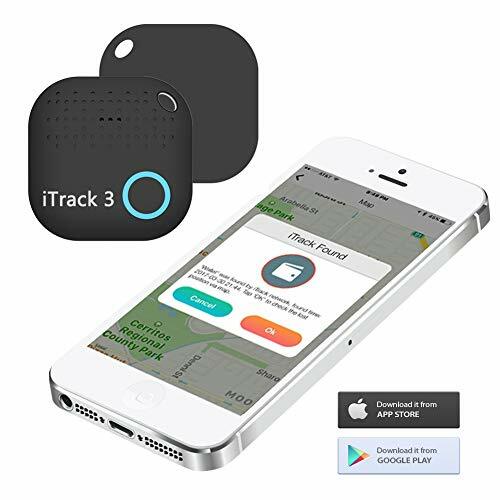 If you have any questions about this product by iTrack 3, contact us by completing and submitting the form below. If you are looking for a specif part number, please include it with your message.